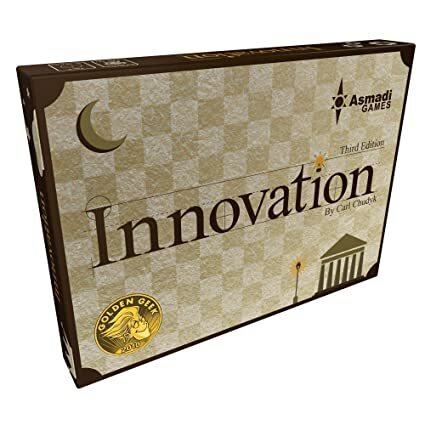 Explain that all the cards are innovations from throughout ten ages of history, from The Wheel all the way to The Internet. Achievements from the ages are how you win, and you can claim them by scoring points, which some card effects allow. Go over each of the four actions. Draw, Meld, Dogma, Achieve is a good order. While explaining Draw, mention how empty piles work. With Meld, demonstrate that cards meld over cards of the same color, and that they'll create stacks. Explain that Dogma is how you use your cards' powers, and then show how sharing works, and how a demand effect would work. Finally, when going over the Achieve action, be sure to mention that points aren't spent, they're a threshold. Splay is the most important concept to go over here. Show that covered up cards are useful by splaying icons. Tuck, Return, and Score are other keywords to cover briefly, but for the most part, explain individual dogma effects during the game, not before it. Deal out two cards to each player, have them meld one, and start playing! Innovation is largely a "learn as you go" game. If you present it as such, people usually have more fun. Don't tell players what to do, let them make some mistakes! A 4 player game of Innovation is not ideal for teaching. 2 or 3 player games are better, because players have less downtime between turns and there is less going on to keep track of. You may never look at the identity of normal achievement cards, even if you have achieved them. You can always look at the cards in your hand, score pile, and board (even if covered up). You can always count and see the value of cards in each supply pile, each hand, and each score pile. The identity of cards partially covered up on an opponent's board. The quantity of cards in an unsplayed color on an opponent's board. Here, we play that neither is open information. But there is no wrong answer - if you want to be able to check the status of every card in play, that's your choice!